This week my husband and I stumbled across some old letters we'd written to each other when we were students and had just met. Oh my gosh they were cringy. We sounded so young. But even though I was embarrassed reading them I'm pleased we kept them. It got me thinking about how different things are nowadays when it comes to love letters. People don't really send handwritten mail any more. The closest you'll come to that is a long email but social media means that new relationships are now conducted through tweets, texts, instant messages etc. Don't get me wrong you can still be romantic through your phone but I find it a bit sad that people won't be digging out crumpled pieces of paper in years to come and reliving those early relationship days again. I had in mind what photograph I wanted to post with these musings and amazingly I came across this one almost straight away. 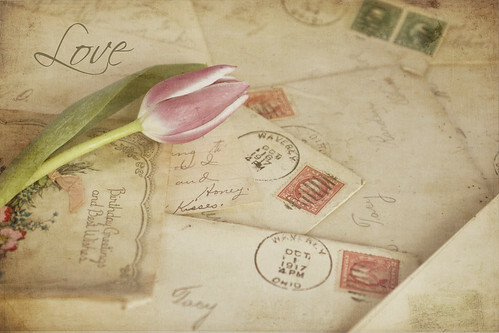 I love the look of these old letters and the tulip adds something extra special to this image. I am sure these letters are full of words as beautiful as this photo.